The Asia Bible Commentary series empowers Christian believers in Asia to read the Bible from within their respective contexts. Holistic in its approach to the text, each exposition of the biblical books combines exegesis and application. The ultimate goal is to strengthen the Body of Christ in Asia by providing pastoral and contextual exposition of every book of the Bible. This commentary on Psalms 1-72 provides an exposition that the reader can engage with in their own community of faith in the Asian cultural context. 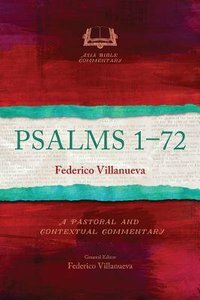 Along with a commentary on each Psalm, Dr. Federico Villanueva provides cultural reflections on a wide variety of relevant topics that include the likes of lament, praise, creation, meditation, depression and natural phenomena. This commentary is an excellent resource for pastors, lay leaders and Bible students but will also be useful and relevant for any Christian committed to applying the Bible in their respective contexts. About "Psalms 1-72 (Asia Bible Commentary Series)"